Pandit students begin when they are 10 years old with lessons in their local villages. 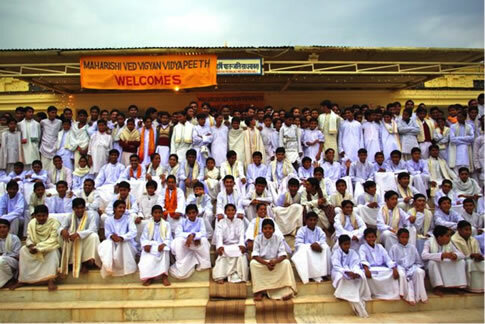 From age 15, they attend residential facilities from which they graduate as Maharishi Vedic Pandits at about age 20. Graduate Pandits, who take their place in the large group at the Brahmasthan, continue to pursue higher degrees in Vedic Science under the auspices of Maharishi Mahesh Yogi Vishwa Vidyalaya (a state university). Even during training, from age 15, the Pandit students begin the group practice of the TM-Sidhi program, which has been scientifically shown to create an influence of peace and coherence in society. 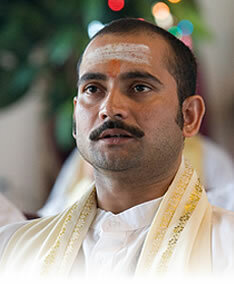 A longer term goal of the Foundation is to establish a group of Maharishi Vedic Pandits in Canada at a facility dedicated to the promotion of Vedic Science.